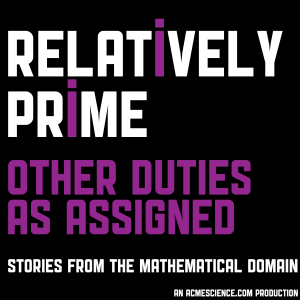 Mathematician is an insanely broad job title It can encompass everyone from professors to government employees to podcast hosts. And all of these different types of mathematicians, They do very different work, In very different ways. Except for that one constant, they all do mathematics. My friends Jess Charlton, Gabriel Siqueiros, Jen Bokoff, and Mike Wolf called me up and let me know just what it is they think mathematicians do all day. Anna Haensch is a Professor of Mathematics at Duquesne University, a mathematics writer, and co-host of The Other Half a pocast about the half of mathematics which helps you makes sense of your own life. Oh, and she tweets too. Kristin Lauter is Principal Researcher and Research Manager for the Cryptography group at Microsoft Research and the President of the Association of Women in Mathematics. She also tweets. Combinations and Permuations was the first podcast Samuel ever hosted. He in no way thinks you should go back and listen to the inane and vulgar jokes he and his fellow mathematics graduate students made during the shows run, but he know he can’t stop you. For Relatively Prime he got some of the old favorites, Nathan Rowe, Sean Breckling, and Brandon Metz, back together in the mail room of UNLV CDC Building 7 to record an episode all about what mathematicians do all day.